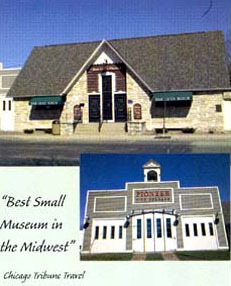 Visit the best small museum in the Midwest as named by the Chicago Tribune. Educational displays tell the story from the settlement of Door County onward. In the Pioneer Fire Station children may sit in a restored 1920 fire truck. The spectacular Seasons of Life wildlife diorama contains over 100 species of native birds and animals including a black bear, a white-tailed deer, and a Wisconsin badger. A theater features DVDs about Door Countys unique history. Open 10am-4:30pm daily, May-Oct.